Special deal! Save while our supply lasts. 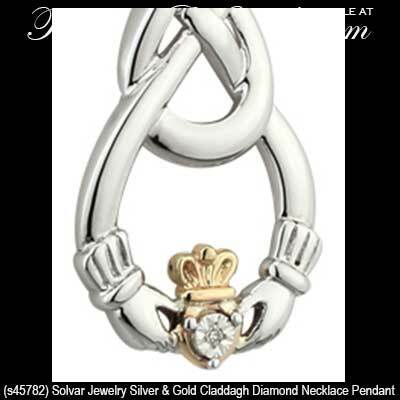 This sterling silver Claddagh pendant features an elongated knot-work motif along with a diamond studded heart. The Celtic Claddagh necklace is enhanced with a 10K gold heart and crown and it measures 1/2" wide x 1" tall, including the jump ring and the chain bail. 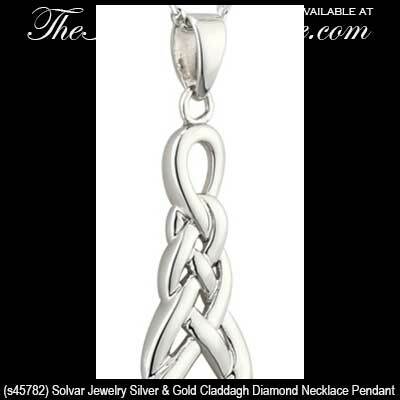 The Irish pendant includes an 18" long sterling silver chain. Sterling silver Claddagh earrings feature an elongated drop style with diamond hearts along with 10K gold accenting and Celtic knot-work.